Good evening, good day, and good night to those who are listening and those who are reading, whatever your calendars or geographies may be. 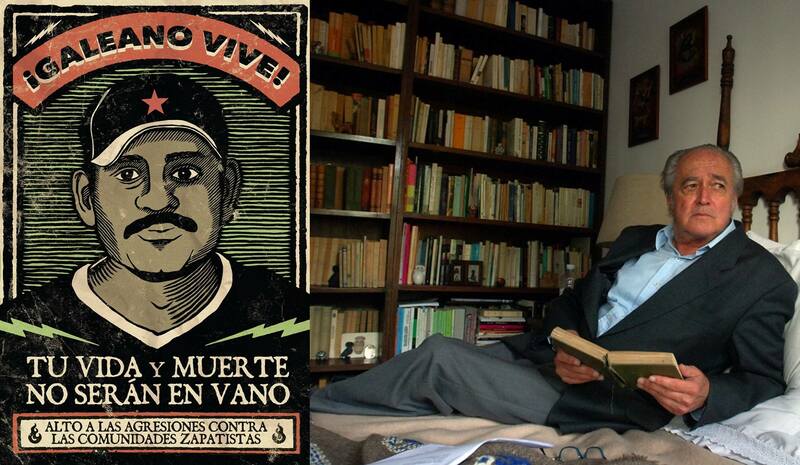 What we will now read publicly are the words that the late Subcomandante Insurgente Marcos had prepared for the homage to Don Luis Villoro Toranzo in June of 2014. He had imagined that the relatives of Don Luis would be present, specifically his son, Juan Villoro Ruiz, and his compañera, Fernanda Sylvia Navarro y Solares. Days before this homage was to take place, our compañero Galeano was murdered. He was a teacher and autonomous authority who was and is part of the generation of indigenous Zapatista women and men forged in the clandestinity of our preparation, in the uprising, in resistance and in rebellion. The pain and rage that we felt then and now over what happened that May one year ago, added to our sorrow over the death of Don Luis. A series of events then played out, one of which was the decision to put to death the person who had been the spokesperson and military leader of the EZLN. The death of SupMarcos was finalized in the early morning hours of May 25, 2014. Among the things left pending, as we the Zapatistas tend to say, which the late Supmarcos left behind, is a book about politics, promised to Don Pablo González Casanova in exchange for a box of pancrema crackers [like Ritz]; a series of unclassifiable texts and drawings (several of them date back to his early days as an insurgent with the EZLN); and the text of the homage to Don Luis Villoro, which I will read in a few moments. In the general command of the EZLN, with Subcomandante Insurgente Moisés, we talked about what this day would consist of, then and now, and we realized that upon taking stock of a life, we were bringing together pieces that would never form a complete whole. We realized that were always left with an inconclusive, broken image. And that what we had and have urges us to seek and find what was missing. “What is missing is merely missing” we the Zapatistas say stubbornly. Not with resignation, never with conformity. But to remind ourselves that history is not complete; we are missing pieces, names, dates, places, calendars, geographies, and lives. That we have many deaths and absences, too many. And that we must grow our memory and our heart so that none remain missing, yes, but also so that they not be immobilized but rather completed time and again in our collective step. This is how we came to imagine this day, afternoon, night, and early morning, as an exchange of pieces seeking to complete the life of Dr. Luis Villoro Toranzo, whom you knew and know. He was a professor in the Philosophy and Letters Department of the UNAM, founder of the group Hiperion, disciple of José Gaos, researcher for the Institute of Philosophical Research, member of the Colegio Nacional, President of the Philosophical Association of Mexico, and honorary member of the Mexican Academy of Languages. “Teacher, father, and compañero”, perhaps his epitaph should read. There are compas, women, men, and otroas that have a special place among us, the Zapatistas of the EZLN. This does not come by gift or donation. This special place was earned with a commitment and dedication that is far from spotlights and stages. So when they inevitably go, we do not echo the noise and dust that tends to rise with their death. We wait. Our waiting is a silent and voiceless homage. Just as his struggle at our side was silent and mute. We let the noise fade away, let another way emerge to replace that which simulates consternation and sorrow. We let the dust settle so that silence once again becomes the serene repose for the one who is gone. Perhaps this is because we respect that life which is now absent, because we respect his time and way of being. And because we imagine that, going forward along the calendar, his silence will be a place from which to hear us. Apart from this, and I mention this as a fact and not as a reproach, Dr. Luis Villoro Toranzo was a brilliant intellectual, a wise person whom perhaps can only be reproached for the closeness he had in life to the originary peoples of Mexico, specifically those who rose up in arms against oblivion and who maintain their resistance far beyond what’s in vogue or in the news. For those who did not know Dr. Luis Villoro Toranzo in life, there are and I hope there will be, roundtable discussions, reprinted editions, and analyses in specialized and other journals. Our word today will not go down those paths. Not because we don’t know his philosophical or historical work, but because we are here to honor a duty, settle a pending task, fulfill a responsibility. We know that we only have one of many pieces. And we have come here to this homage, to give to those who shared and share with him blood and history, a piece that we believe they may not have known and perhaps may not have even imagined. History from below, from the angle of the Zapatistas, has many blind quarters, watertight compartments in which different lives are lived with apparent indifference, and in which we only see and learn about the life that took place there when death crumbles the walls. And so that we can make, how do you say it? An exchange? A trading of places? Upon opening the compartment and toppling the fourth wall, upon finding ourselves inside, we make a swap: this death to the museum, this life to living. “Watertight compartments,” I’ve said. Our way of struggle implies a quota of anonymity which is only desirable to some of us. But maybe later on there will be a chance to come back to this. You will hear Subcomandante Insurgente Moisés speak to our compañeras and compañeros from the Zapatista communities about one aspect of what Don Luis Villoro Toranzo was to our struggle. The great majority of them did not know him, had never meet him. And just like him, we have compañeras,compañeros and compañeroas whose existence is not known. The sudden knowledge that we had compañeros and compañeras that we didn’t know existed until they no longer existed is not something new for us Zapatistas. Perhaps in our manner of doing things, naming the life that is missing is a way to bring it into existence in another form. Just like it was our manner of doing things to bring the indigenous Zapatista Galeano to the collective then, and Don Luis Villoro now. Our way of hurrying them, pressuring them, yelling to them, “Hey! No time to rest!” to bring them back so that they can stay in the fight, the task, the grind, the work, the path, life. But it’s not a life I am going to tell you about. Neither is it about a death. What’s more, I’m not here to tell you anything. I am here to draw you an outline, more or less defined, more or less clear, of a piece of a gigantic puzzle, both terrible and marvellous. And what I’m about to tell you will sound fantastical. Perhaps my brother under protest (his), Juan Villoro, will later discover in my words a thread from an absurd and complex plot, one closer to literature than to history. Perhaps it will later help him complete that book that he doesn’t yet know that he will be writing. Perhaps Fernanda will intuit a breakthrough concept that appeared elusive, filling a void which leads to the theoretical overturning of an entire line of thought. Perhaps it will later help her initiate the reflection that she does not yet know that she will undertake. 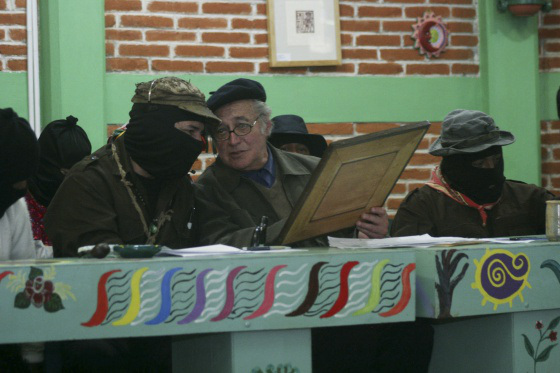 I should, for security reasons, be intentionally imprecise about the geography and the calendar, but I can tell you that it was in the wee hours of the morning, and it was at the EZLN headquarters. It may be that a brief description of the Zapatistas’ general command center may disappoint more than a few of you. No, there is no giant map with multicolored lights or colored pins covering one of its walls. No, there is no modern radio communication equipment with voices speaking in many languages. There is no red telephone. There is no modern computer with multiple monitors dedicated to encrypting and decrypting the dizzying static of the cybernetic matrix. There is just a pair of tables, two or three chairs, a few cups with cold, leftover coffee, crumpled papers, tins of tobacco, and smoke, lots of smoke. Sometimes there is also a stale bowl of popcorn, but that’s just in case we need to make a trade with some out of the ordinary being who pops in. I’m not going to elaborate on this particular way of resolving legal disputes among beings who are so far removed from either real or fictional jurisprudence. Let’s just say that the bowl of stale popcorn is there for a reason. We may, although certainly not always, have a laptop computer and a printer. I won’t mention the brand or the model, but suffice it to say that the computer functions through insults and threats, and the printer has a peculiar sense of agency, because it refuses to print that which it doesn’t see as worthy of moving beyond the screen. Viruses? Only the ones that manage to get through the reed that we use to connect to the network. That is to say, spiders, or the bugs fleeing said spiders, while a little light blinks frantically. But we’ll leave it up to you to imagine what the rest of the furniture looks like. I could make myself look good and tell you that on that morning I was reading some treatise of Greek Philosophy, or the Fabulae of Hyginus, or the treatise Apollodorus of Athens on the Gods, or TheTwelve [Doze] Labors of Hercules(yes, with a ‘z’), by Enrique de Villena, the Astrologer,[i] but I wasn’t reading any of that. Or I could tell you, and make myself seem all modern, that I was there in the deep web taking an online course with an anonymous hacker. I almost said a famous hacker, but if they are anonymous then they can’t be famous. Or can they? Or maybe it is an organized collective: “click the reload button, press the control key, no, don’t touch the letter “z” because it will create a chaotic mess and you will end up chatting with an incomprehensible being in the mountains of southeastern Mexico.” In short, it’s a nickname and an avatar, something like a nom de guerre and a ski mask, that patiently explain the fundamentals of a terrain of struggle. And just like every time you learn a new language, the first thing you need to know are the insults. And that’s how you know that a calling someone “newbie” is insulting. In the doorway appeared the posta, the guard, the sentinel, the lookout, or whatever you want to call him. – “Sup, there is someone here who wants to talk to you”-, he said tersely after giving the military salute. -“Who?” -I asked almost as a formality because I was already assuming that it was insurgenta Erika with one of her intricate riddles about love and that type of thing. -“One Don Luis,” he said. “He is old and wise,”- responded the insurgent. -“Don Luis? I don’t know any Don Luis,”-I said with annoyance. -“Subcomandante,”-I heard his voice and saw his figure fill the doorway. “Ah, he didn’t follow instructions, typical. It’s ok,” I said to the guard and I exchanged a hug with Don Luis Villoro Toranzo, born in Barcelona, Catalonia, in the Spanish State, on November 3, 1922. I offered him a chair. Don Luis sat down, took of his beret and rubbed his hands together smiling. I assumed because of the cold. Did I already say that it was cold that morning? And it was cold, as it usually is when there is no sun to warm up the shade, like today. What’s more, the cold bit our cheeks like an obsessed lover. Don Luis didn’t seem to notice. “Does it get cold in Barcelona?” I asked, in part as a welcome greeting, and in part to distract him as I discreetly turned off the computer. In the end, I put away the computer, requested coffee for three, and re-lit the pipe, already filled with moist and used tobacco. I can’t remember now whether Don Luis responded to the question about the climate in Barcelona. He did wait patiently for me to finish failing at what I was attempting to do, waiting for me to stop trying to relight the embers in the pipe. “You don’t have tobacco by any chance?”I asked him, anticipating his answer with disappointment. “I don’t remember,” he said, and continued smiling. Was he answering about the cold in Barcelona or on whether he had any tobacco? But these weren’t the main questions that accumulated in the snuffed out bowl of my pipe. At that time, the EZLN headquarters was in the “Bed of Clouds,” so named because it was located high up in a mountain and except for the few days of the dry season, it was always under cloud cover. Even though the general command itself is nomadic, sometimes it stays there awhile, although never for as long as the clouds do. Getting there isn’t easy. First you have to cross pastures and abandoned fields. It’s bad in the rain and bad in the sun. After two hours of thorns and insults, you arrive at the foot of the mountain. From there, a stretch of the trail rises up, skirting the steep hill such that there is always an abyss on your right. No, it wasn’t political considerations that decided this spiral ascent; it was the capricious shape of this mountainous peak in the middle of the mountain range. Even though you don’t stop climbing until you are almost at the doors of the hut of the general command of the eezeeelen, a few works of military engineering had been built such that the guard at their post would have the time and distance necessary to see people coming from far away. From there, the kind of walking necessaryto access the hut was intentionally difficult. To the harshness of the mountains, we added pointy stakes, ditches, and thorns, such that it was only possible to pass one at a time. When I was young and beautiful, and carrying an average weight–let’s say some 15-20 kg–, it took me about six hours to get there from the base of the mountain. Now that I am only beautiful, and without carrying anything, it takes me between eight and nine hours. Our premodern roots and our contempt for electoral campaigns inhibit us from getting helicopters at our camps. So you can only get there by walking. Don Luis appeared to be well put-together, not visibly agitated, his beret intact, his dark bag had just a few strands of roots and twigs hanging off of it, his corduroy pants barely dirty and only in the creases, his moccasins were in one piece. Well put-together. If there was anything worth noting it was his several-days-old beard and the obvious absurdity of his clean shirt, with its starched open collar. For me, this climb takes at least three shirt mendings, four for my pants, a reinforcement of both boots, and a couple of hours trying to catch my breath. But Don Luis was here, sitting in front of me. Smiling. Apart from a slight flush in his cheeks, you could have said that he had, in fact, just gotten out of a taxi. But no. Don Luis’ response had been, “by walking,” so there had been no taxi. I was about to let loose with a long list of reprimands about his health, the calendars having taken a toll on him, the impossibility that, at his advanced age, he should try to do such crazy things, like climb a mountain and present himself in the wee hours of the morning in the general command of the eezeeelen, but something stopped me. No, it wasn’t the incontrovertible fact that he was actually there. It was that Don Luis’s smile had become nervous, restless, as if fearful not of asking questions but of having the answers. And so I asked a question that would mark that dawn. “I want to become a Zapatista,” he responded. His voice did not hold a trace of mockery, sarcasm, or irony. Nor did it hold doubt, fear, or insecurity. I had already seen city people declare their intention in this way (although not with those words, because they usually do so with incendiary slogans and bombastic language, a lot about death and little to nothing about life), although of course, they don’t get past the pasture. I choked, and the pipe wasn’t even lit so that I could pretend it was because of the smoke. Resigned to the lack of dry tobacco, I had been merely nibbling on the mouthpiece. “I want to become a Zapatista,” he had said. Don Luis had used an expression that was more a part of the daily life in Zapatista communities then it was part of Mexican Academy of Languages. I explained in detail the geographical, temporal, physical, ideological, political, economic, social, historical, climatic, mathematic, barometric, biological, geometric and interstellar challenges. To each difficulty that I detailed, Don Luis’ smile lost some of its nervousness and gained security and composure. By the time I got to the end of this long list of inconveniences, Don Luis was smiling as if he had gotten a seat in the Colegio Nacional, rather than the diplomatic “NO” that I was dishing out. “I’m prepared,” he said, as I crunched down on the last solid bit of the mouthpiece of my pipe. Trying to dissuade him, I explained the inconveniences of clandestinity, of hiding oneself, of anonymity. It was clear that I wasn’t doing the best job. As much as I shifted in my chair and nervously moved things around the desk, I couldn’t figure out a logical explanation for the absurdity of the situation. Don Luis adjusted the beret on his thinning silver hair. “This is my ski mask,” pointing to his beret. One was that, in continually moving things around on the desk, I had found a little bag of dry tobacco. The other was that the question from the doctor of philosophy Luis Villoro Toranzo had bought me time to try to arrange the pieces and understand what this was all about. So, I hid myself behind some words in order to be able to think things through. “Correct,”he said, raising his right index finger. “If I take this nom de guerre, no one will know that I am a Zapatista. They will all think that I am the philosopher Luis Villoro Toranzo. I sat down, now seeing where this was going. “There you have it, with the beret and the name I show myself, that is to say, I hide myself. I would have said “Touché,” but I was so disconcerted that my French got stuck in the trunk of forgetfulness. I spent the rest of the night and early morning hours arguing against the idea while he argued in favour of it. Let me say that, I had to admit that his logical reasoning was impeccable, and with grace and good humour he dodged one false trap after another of the kind with which I can usually trip up the most renowned intellectuals. And yes, I am being sarcastic, just so nobody takes offence. The case, or the thing was that Don Luis Villoro Toranzo, aspiring Zapatista whose nom de guerre would be “Luis Villoro Toranzo” and who better hid himself with a black beret than with a ski mask, was dismantling one after another of the obstacles and objections that, out of a certain necessity, I was putting up. “Your age,” I lobbed at him the last argument that I had, nearly at the point of collapsing. The light of dawn was already beginning to outline the edges of the horizon when I decided to assume the best position in cases like these: I pled insanity. 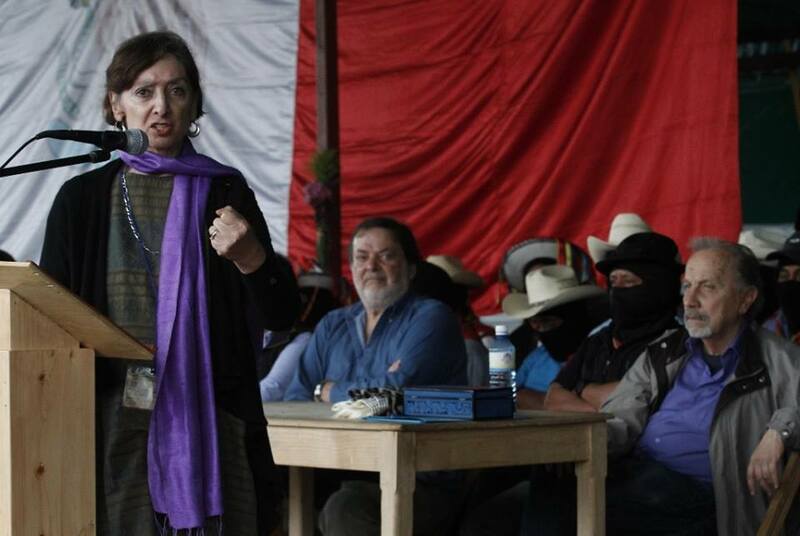 “Look Don Luis, if it were up to me, of course, it would be an honour, but it isn’t my decision, of course, to accept or reject a request to join the EZLN, of course. I am, of course, let’s say, the Synod, sure, but someone else has to approve the decision. After that, there is the local authority, and of course the regional one and of course the comité,[iii] and the general command of the Zapatista Army for National Liberation, of course. Why don’t you go home and I’ll just let you know as soon as I know something? But… just as I was saying this, the other indigenous person who completes the trio of me and Moy came into the general command. “Well,” he said, “I was actually talking to Luis Villoro Toranzo, not to you. “He had already talked to me, and I told him that in any case he should go and talk to you to check out your arguments. “But the deed is done: I have already registered him in the special unit. Now for us he is our colleague Luis Villoro Toranzo. And the already Zapatista compañero Luis Villoro Toranzo stood up and, with admirable poise, stood at attention and greeted the officer. “And what work will we assign him?” I managed to ask in the midst of my confusion. “Well, the one that he’s always had: the watchman,”said the other and left. You could probably venture a guess that Juan, Fernanda, and those others who are listening to me now and who will read this later, have heard these words as just one more of the fantastic stories that populate the mountains of southeast Mexico, told over and over by beetles, irreverent little boys and girls, ghosts, cat-dogs, twinkling lights, and other absurdities. But no. 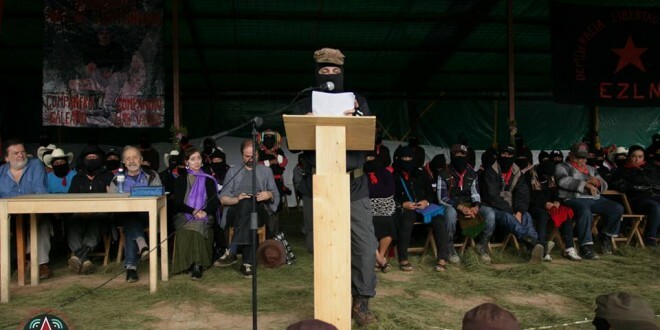 It is time that you knew that Don Luis Villoro Toranzo became part of the EZLN one early morning in May, many moons ago. 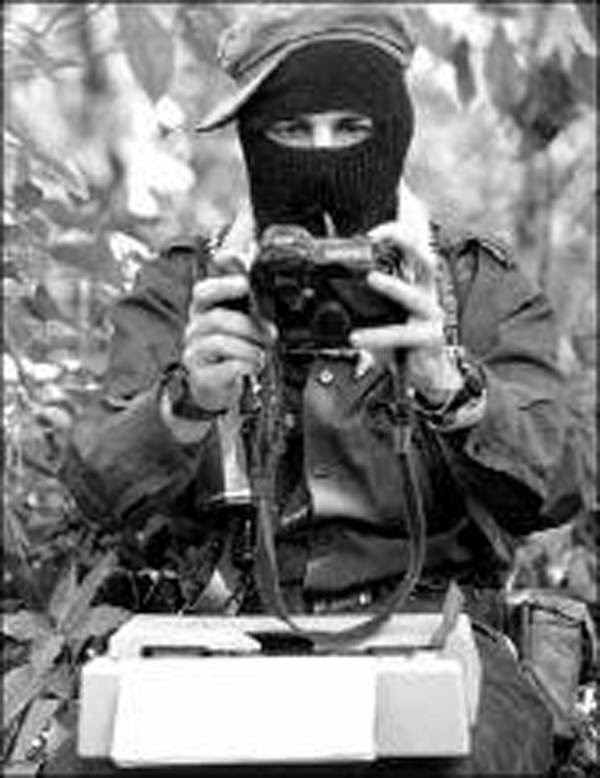 His nom de guerre was “Luis Villoro Toranzo” and in the general command of the EZLN we referred to him as “Don Luis” for brevity and efficiency. It happened in the general headquarters “Bed of Clouds,” where he left his brown shirt for the many return visits that he made there before he died. He fully carried out his mission. As a sentinel in one of the guard posts on the Zapatista periphery, he was attentive to what happened; out of the corner of the eye of critical thought he was attentive to the changes and movements that, for the vast majority of the self-proclaimed progressive intellectuals, go unnoticed. As a result of his responsibility for sounding the caracol, in the coming days you will hear, and a few more of you will read, the reflections we have made on these changes and movements. It was another morning. Don Luis, then-Lieutenant Colonel Moisés (now-Subcomandante Insurgente Moisés), and I had started talking around 1700 hours on the southeast battlefront. Around 2100 hours, SupMoy, as he is called now, excused himself to go check on the surrounding positions. Don Luis had a particular way of debating: where others gesticulate and raise their voice, he would smile with a wandering absence. Where others argued with slogans, he would say something absurd “Just to give himself time,” I thought to myself. “Ah! Zapatista resistance!” he exclaimed with enthusiasm. “Not one, many,” I told him. It must have been around 2005-2006. Years earlier Don Luis had joined our ranks, and the Good Government Councils were immersed in the health and educational needs of the zones, regions, and communities. Really, Don Luis’ idea was not original. Prior to this both Pablo González Casanova and Adolfo Gilly had sketched this out in different words. But our idea is neither to teach nor to “show.” But rather to provoke. The “And what about you?” did not seek an answer, but rather sought to incite reflection. The discussion turned into a conversation in the same way that a flood reaches a flat plane in its meandering, and becomes a calm flow. Calm but unstoppable. It was already early morning. The night guard informed us that Moy was still busy and he offered us coffee. When I looked to him, Don Luis responded with an affirmative gesture. I don’t really know if Don Luis even drank coffee, as his cup was always left untouched. I chalked it up to the heat of the conversation. Now I realize that I never once asked him if he even drank coffee. One could assume, of course, well, he’s a philosopher, of course, and “coffee” is to a philosopher like an undesirable surname. Or maybe he did drink it. Well, we are in Chiapas. Coming to Chiapas and not drinking the coffee is…. like going to Sinaloa and not eating the chilorio,[iv] like going to Hamburg and not trying a hamburger, like going to La Realidad and not coming across reality. The point is that without even noticing, we started talking about gifts. “Imagine what would be the perfect gift,” he said. “The most surprising,” I responded without thinking. “No, the one that you couldn’t thank someone for,” he responded. “Or the one that is not a gift,” I counter attacked. “Like for example an enigma or a piece of a puzzle. That is, a gift that has no reason to be so. If there is no reason, the surprise grows,” I said. “True, but for the giver of the gift, it could be a gift to not be able to be thanked for the gift,” he said to himself. Don Luis had a fever. The insurgenta responsible for health matters recommended a fever-reducing medicine, a cold bath, and lots of liquids. Don Luis didn’t argue with any of this. But when the compañera left he said “All I need is a little bit of rest” and he fell asleep. He was like this for two days, only waking up to eat and to go to the bathroom. Once rested, he told me that he should get going and he recommended that I re-read his vigilance reports and he said goodbye. Before crossing the threshold at the door, and without turning around to look at me, and more to himself, he murmured: “Yes, a gift you can’t be thanked for. This would be very Zapatista.” He put on his beret, said one more thing to me, and left. Today, after more than 12 moons of his absence now, I can talk about what he said as he was leaving that morning, as the sun was raising light and shadow. “Compañero Subcomandante Insurgente Marcos,” he said squaring himself toward me, with a notable vitality. “Compañero Luis Villoro Toranzo,” I said following my habit of indicating that I was ready to listen. I noticed that he abandoned his usual informality, but I chalked this up to his new profession. “Don’t go telling anyone about any of this, for the moment,” he demanded. “Tell them my story. I mean, this part of my story. That way, they will understand that I didn’t hide from them. I just saved it as a gift. Because the reason we like gifts is because they are a surprise… Don’t you think? “Tell them that I am giving them this piece of my life. Tell them that I kept it from them, not as one hides a crime, but as one hides a gift. So, Juan, Fernanda and other members of Don Luis Villoro Toranzo’s family, for years I have kept this piece of the extended puzzle that was the life of Don Luis. Not then, but only later, after the rage and pain arose from the massacred body of the compa and Zapatista teacher Galeano, did I understand why he held back this piece of his life. It is not that he hid it because he was embarrassed, or because he was scared of being denounced to the enemy of a thousand heads, or in order to avoid having others try to dissuade him. It was because he wanted to give you this gift. A piece that provokes, that nourishes, that agitates, like his thought turned into a mischievous wind within us. One more piece of Don Luis’ life. The piece that was named Luis Villoro Toranzo, a Zapatista in the EZLN. He fell, and fell silent, in the line of duty, carrying out his task of sentinel in this absurd, terrible, and marvellous world that we endeavour to create. I know that he left a legacy of books and a brilliant intellectual trajectory. Vale. Cheers and accept this embrace from all of us that compa Zapatista Don Luis left saved with us. From the mountains of the Mexican Southeast, and now from underground. Made public May 2, 2015. [ii] Both the “The Baker Street Irregulars” and the “Speckled Blonde” are fictional characters that appear in Arthur Conan Doyle’s Sherlock Holmes stories. “Albion” was frequently use by Doyle as the location of these stories and it is also the oldest known name for England. [iii] The Indigenous Revolutionary Clandestine Committee. [iv] Slow-cooked carnitas made with ancho chile sauce.